With a wide selection of models in their current range that are designed for everyone from casual users to serious athletes, NordicTrack have made it their business to ensure that whatever your fitness goals are, you’ll find something in their range to suit your needs. With fierce competition from all over the world in the home fitness marketplace, the pressure has been on stay ahead of the game and retain their iconic status as the worlds leading home fitness equipment manufacturer. The NordicTrack GX 4.6 upright exercise bike is mid-point model aimed at doing just that so we got one in to get a close up look at what’s on offer. Assembly of the GX4.6 is surprisingly easy. Now, admittedly, we do know a thing or two about assembling exercise bikes but even so, you could almost put this particular model together without the instructions and in fact for a large part of the assembly that’s exactly what we did. Not that we’d ever recommend trying that at home, but it’s worth mentioning here to illustrate just how simple NordicTrack have kept things. Following the manual is very straight-forward with clear pictures, easy to read and understand text and a logical progression through the process. This is most definitely not always the case with exercise bikes, especially on more advanced models such as this one, so you’d have to say that they’ve got this right and that this is a bike that pretty much anyone will be able to put together. With a footprint of 102cm x 61cm (40” x 24”), the GX4.6 is substantial without being overbearing in size, making it suitable for a wide range of settings such as the living room or a spare bedroom and not just for a dedicated gym. It’s a good looking bike that has a chunky look to it and with heavy gauge steel components really does appear as if it’s designed to take a hammering. It’s also abundantly clear that NordicTrack are determined to make sure that this bike is comfortable. The handlebars are adjustable for reach and the seat is horizontally adjustable as well as vertically, while just one look at the oversized and heavily padded seat tells you this is not going to be a bike that’s likely to leave you saddle sore. Before jumping on for the first training session, a quick play around with the leg levelers (situated both front and rear) results in the bike feeling rock-solid without any discernable unwanted movement. Getting the right riding position is quick and simple with the horizontal and vertical adjustment on the seat and the angle of the handlebars quickly changed using the quick release knobs. The height of the seat can be adjusted a good deal making this bike suitable for pretty much most adults and will comfortably cater for anyone from about 5ft 5″ to 6ft 6″, though as always if you’re unsure if it’ll be suitable for you because you’re very close to either of these heights it’s worth putting a call into NordicTrack or your local retailer to double check. Once adjusted, the only thing left is to plug the bike into a mains socket and it’s ready to go. Sitting on the bike immediately confirms that the seat really is as comfortable as it looks and the overall riding position is ergonomically sound with all controls within easy reach. There’s no undue strain on the back and the knees are in the correct position in relation to the feet and the action is also quiet and smooth, aided by the substantial 9kg (19.8lbs) flywheel. The resistance levels also change quickly and smoothly without making any unwelcome or unexpected noises. All of these things combine in such a way as to ensure that even after a heavy 45-minute training session the GX4.6 feels a comfortable as it does when you first get on it! NordicTrack have been building bikes for many years, and it really shows here. The console features a 5″ backlit display that’s easy to read and is also adjustable for contrast so even in well-lit areas keeping track of your training data isn’t a problem and it’s also possible to change the units of measurement from miles to kilometers (though amusingly you’ll need to select between ENGLISH and METRIC in the settings menu to make this choice). Training data including RPM, calories, distance, pulse, resistance, speed, time, Watts and Cals/Hr is all clearly displayed and there are 20 preset workouts and a manual mode to choose from. Manual mode is just that – get on, switch on the console and start pedaling and you’re on your way, with resistance being adjusted by simply pressing the plus and minus keys on the console. The 20 preset workouts are helpfully divided into two groups of Calorie Workouts and Performance Workouts keeping things as simple as it’s possible to get and because of this and because of the logical and clear layout of buttons, getting to know how to use the console is a quick and painless affair. To top things off there’s also a Bluetooth wireless heart rate receiver built in which provides a more accurate heart rate reading that the handpulse sensors and other non-Bluetooth standard receivers, making this quite a package. In addition to the onboard workouts, the GX4.6 is also iFit compatible so you can connect a tablet or smartphone to the bike via Bluetooth and get access to customised training programmes, automated workout statistics tracking, Google Maps routes and a new daily workout every day,high-definition workout videos led by professional personal trainers, online races against other iFit riders and more. A subscription is required if you want to use iFit and the full details of what’s available are worth checking out at www.ifit.com if you’re looking for a fully integrated long-term workout programme iFit can add an extra dimension to your training though it’s certainly not a necessity here as the GX4.6 offers plenty of workout options built right into the console. 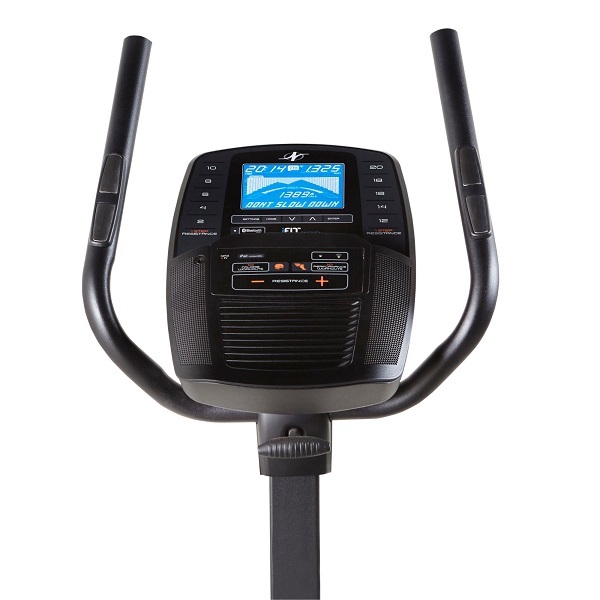 Other console features that you often won’t find on many bikes at this price point are a music port so you can plug in your music player, two audio speakers, workout fan to help keep you cool during your training sessions and a tablet holder. There’s also a Bluetooth wireless receiver as well as hand pulse sensors for heart rate measurement which is always good to see. Overall the GX4.6 delivers in the places one wants an exercise bike to deliver. It’s very, very comfortable, it’s easy to use, it’s very sturdy indeed and it has enough training options built into it to keep you from getting bored with your daily routines. In addition, it’s not too big to fit into most rooms and it comes in at a price that represents a lot of value for money. It’s also well designed and manufactured to a high standard which is reflected in the 5 year frame, 2 year on-site parts and labour warranty that’s provided. All of this makes this bike very easy to recommend and if it’s not already on your shortlist, it really should be. The NordicTrack GX 4.6 is not currently available from any retailers we're aware of in the UK. The NordicTrack GX4.6 offers outstanding comfort, great build quality and enough training options to keep you entertained practically forever. It's also easy to set up, easy to use and is suitable for both beginners and advanced users while also looking the part. 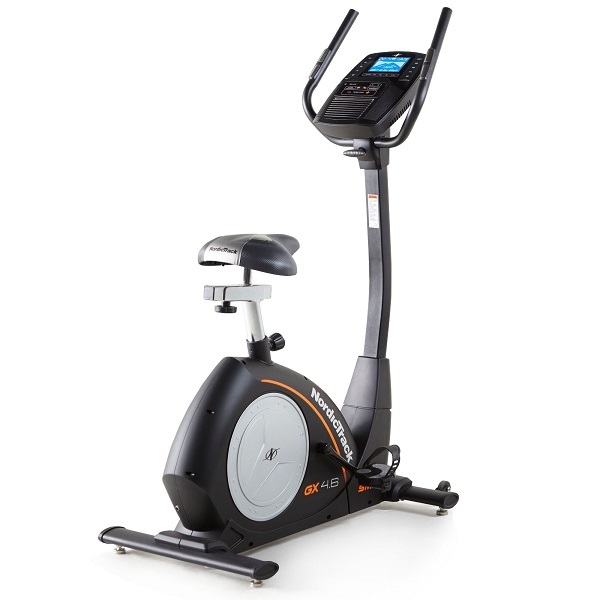 With NordicTrack's excellent warranty you get peace of mind too so if you're looking for a comfy and reliable bike at the price point then we're happy to recommend this excellent upright bike.